In 2007 Paul Kloschinsky won the Music Aid Award for Best Canadian Songwriter. He resides in BC, Canada. I remember when I used to live in Canada the air was fresh and everything seem to have an extra sensitivity to the nature around us. Paul’s latest release, “Woodlands” has that same authenticity. Each song has an unique feel to it. It is mellow and dreamy. There are some enticing guitar solos and picturesque lyrics. I can see why he won an award for his songwriting skills. He has an interesting way to tell a story with his droning melodies that leave lasting impressions. The CD was appropriately titled. It is a journey through undiscovered territory. The music takes you on a pleasant stroll in the back woods and gives an appreciation for the world around us. The CD is as natural as the air we breathe. 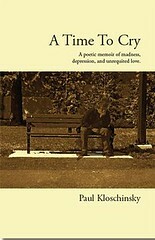 Paul Kloschinsky’s CD, “Woodlands” is worth a listen. It provokes a sense of foreboding and then offers a comfortable resolution through melody and story telling. This CD is a 45 minute ride through atmospheric music. He claims it was a decade in the making. Within that time each song has grown into a life of its own.